The layout came from Mary Jo Albright. Maybe a year or more ago, I found an awesome card by her on Splitcoast, and I copied the photo of the card to my hard drive. I often do that, when I see a creation I want to be inspired by later on. I changed up plenty of things on my own version of this card, including the addition of bling under my Scallop Dot punched border. 'Something different', as my grandmother used to say. I hope this pic gives you a better view of it. I used crafting tweezers to help me carefully arrange them. Hope you get a chance to play with us at The Play Date Cafe this week. See you there! What a yummy colour combo and I love your card! The EF you used is great and lovely touch with the bling under the punched holes. Looks beautiful with the pearls under the border. Clever idea - must have taken some time to do. LOVE your buckle and the gems inside the punched border, colleen:) so pretty! I love me a butterfly, that's for sure! Your card came out beautifully, Col...the colors are just striking together and those blue gems are out of this world lovely! Love this color scheme and the gems under your punch --- excellent! Simple with a fabulous WOW factor! The colors pop against that neutral but very interesting background! Love it! Great card Colleen! Love the buckle bling on your ribbon! CAS worked, this is fantastic Colleen! I too would be stumped with this, but you worked it beautifully! The ribbon & buckle is perfect, & I love the jewels under the punch! Stealth bling! Love it! Bold and beautiful take on the original! I love your interpretation of Mary Jo's card! That blue butterfly is beautiful sitting on the emobssed background. I love the bling under the punched edge. What a great idea! Oh, this is too fun, Colleen! LOVE those little, punchy windows to your fabulous gemstones, and your little belt buckle wraps this beauty up perfectly! I just love you take on this card.. It is beautiful.. I just love the butterfly.. I hope you are having a happy day!! First, I love the rust color. I used a pretty rust yesterday and everyone called it orange. Great card using the slide and the gemstones look great under the punched holes. Fun! Not sure which detail is my favorite - the slide or the bling under the border or...... Anyway, a fun card. Interesting colors and I like the slide idea and the ribbon or is it really called ribbon? Anyway, I like it! It is sort of refreshing in an orange sherbet way! Sorry, that was what first came to my mind. Yeah, I know a bit strange! Wowee! Love those inset rhinestones and how you combined the colors just perfectly. The color of the twill is gorgeous against the very muted gray/blue. See -- another awesome card! Soooooooooooooo cool and gorgeous all at the same time. BEAUTIFUL card Colleen. 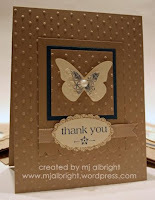 I have that embossing folder and love it!! It's such a pretty CAS card with the cutest details. Love this! This is so beautiful Colleen, love the carefully placed gems under the pouched border, and the gorgeous ribbon too! Stunning! Your card looks fabulous Colleen - you can't go wrong with clean and simple. I love your die cut storage in the post above, what a great idea!